When William and Jane Jacka, with a growing family, went north in 1862 to try farming near Pine Creek south of Auburn, Jane’s sister Caroline was with them. 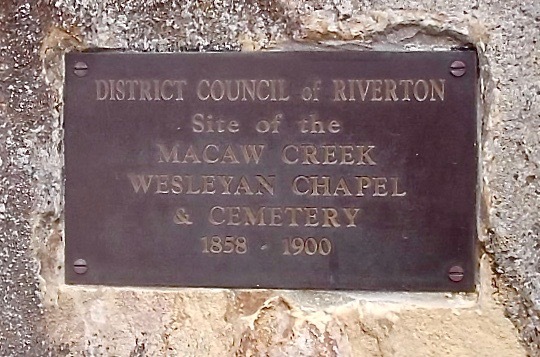 In 1864 she married Benjamin Bleechmore at the Wesleyan Chapel, Macaw Creek, a little south west of the farm (The Complete History, pp 219-20). The photo on p 220 of the book shows what we believed to be the ruins of the Wesleyan Chapel, close to where the creek crosses Macaw Creek Rd, near its eastern end. Local John Smyth, a retired farmer living in Riverton (see paragraph on “Sunnyside” under William Jacka Jnr and Jane for more about John) alerted us to the true location of the former chapel, a little over a kilometre further west. The location is marked by a roadside plaque (see photos) but there are few other indications that a chapel, the scene of Caroline’s 1864, wedding, once stood on the site. The erroneous photo in the book in fact shows the ruins of farm buildings on what is known as “Grey’s Paddock”. Di Nash of Canberra is a descendant of Samuel Nash and Harriet née Coombe (Chapter 12 in The Complete History). She has emailed us with information about William Albert Bleechmore who was born in Auburn in 1867, son of Caroline Bleechmore née Coombe, Harriet’s younger sister. Caroline was widowed in 1869. William spent his adult life in mining areas of New South Wales but was not, as we surmised, a miner. He was a police officer. Di informed us that he was appointed a probationary constable on April 14 1891. He worked in various places west of Sydney and was the sergeant in charge at Gulgong when he died quite suddenly in May 1917. He had been chatting to the Minister for Lands and a Sydney reporter in Mayne Street Gulgong when he collapsed and was taken to his home, where he died several hours later. Wendy Walker, who is a great-great granddaughter of William and Jane Jacka through their eldest daughter Mary Lilla Jane, is a long time researcher of Jacka and Coombe family history. She recently sent us related information about William Albert Bleechmore’s career in the New South Wales Police Force including references to the New South Wales Police Gazette for 1902 and 1911. Di has suggested that perhaps Caroline and William went to New South Wales after the death of Benjamin Bleechmore, Caroline’s husband and William Albert’s father. Unfortunately the fate of Caroline is still a mystery. Di told us that William Albert’s death certificate listed his deceased father but had no information under the heading ‘mother’. This suggests William lost touch with his mother, perhaps because she was long dead by 1917 or perhaps because they had a falling out. Di Nash also provided additional information about Harriet and Samuel Nash’s family (Chapter 12). Their death certificates show that they had not two but three children who lived to adulthood, and according to the birth certificate for the John Nash who survived, there had been not one, but three children who died prior to 1860. The daughter, Jane Harriet, was born about 1858, which would make her a twin of the John who was born and died in 1858, but a record of her birth has not been found. She married Robert Lancelot Walton in 1881 at Wodonga and they had six children, five of whom survived to adulthood. Two of their daughters married two Chanter brothers and another Chanter brother married Victoria Nash, daughter of Samuel Nash Jnr and Mary Emma Bright. In the same communication, Di Nash has corrected our suggestion that our Samuel Coombe left for the goldfields on the Competitor in January 1851 (Chapter 12, p. 216). She suggests that this was a different Samuel Coombe who arrived on the Himalaya in 1849, and whose obituary of 1899 stated that ‘he went to the Victorian diggings when they first broke out and was very successful.’ She cited a petition in the South Australian Register of 17 November 1853 regarding the setting up of a separate district of Kanmantoo. One of the signatories was Samuel Coombe of Staughton (near Kanmantoo). Di’s scenario seems very likely. Our Samuel Coombe certainly was at the Victorian goldfields, but apparently left South Australia after November 1853, perhaps in company with his daughter Harriet and son-in-law Samuel Nash. Many thanks to Di and Wendy for correcting and filling out the story of this branch of the family.